20 athletes represented the club at the Munster Championships in Clarecastle, Co. Clare on Sunday and everyone who ran gave it their all over a testing course with greasy underfoot conditions. Considering the weather of the past week the course could have been a lot worse and great efforts were made by all our athletes over the various distances. At U/10 level Alana Spillane ran a quality race to finish 18th overall from a very large field of runners. Dearbhla Gleeson came through for 65th with Orla Duggan 106th, Mairead Duggan 124th and Sarah McGinley 132nd. In an equally competitive Boys event Luke Walsh had a solid race to finish 65th as did Jack Reddan in 81st. At U/12 level two girls and two boys were in action with Saoirse Doran running a very strong race to finish 38th with Una Duggan coming through for 136th. 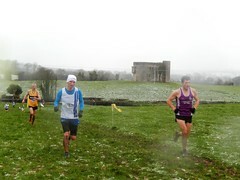 Adam Phelan and Cormac Burke also put in a great effort to finish 108th and 117th respectively. In the Girls U/14 event Helen Cleere moved through the field to finish 45th while Aaron Moore ran a great race to finish 38th with Jake Bowe coming through for 67th in the Boys event. Another top 30 place was earned by Emma Gleeson who finished 28th in the Girls U/16 race and Gavin Ryan who crossed the line in 26th place in the Boys event. Aine Duggan, having survived a nasty fall, coming through for 59th in the Girls race with Dylan McLoughlin powering home to finish 32nd in the Boys equivalent. Just two athletes represented us at U/18 level and both did extremely well with Aoibheann Duggan finishing 36th and Nathan Bowe 28th in their respective events. Though teams from Tipperary visiting the winners rostrum was rare the club had a number of athletes who made these County teams and these included Alana Spillane, Saoirse Doran, Helen Cleere and Emma Gleeson but their respective teams finished out of the medals in either fourth or fifth place. Well done to all.